Whenever we come home from traveling I'm always reenergized to do two things: eat healthy and save money. Our trip was usually so fun I can't wait to save for the next (/am worried we splurged too much while away), and we've eaten out so much I know I have to give my body a break. 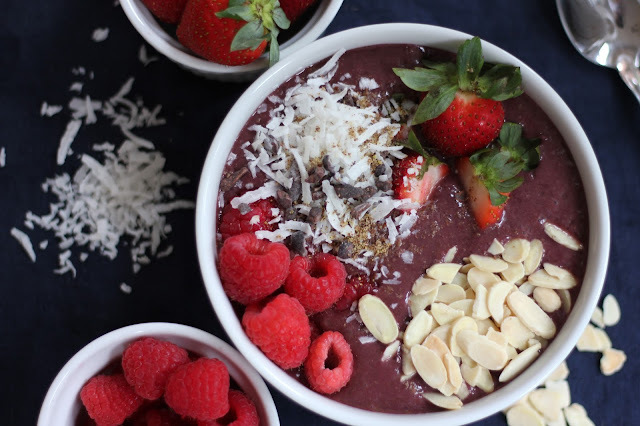 My go-to in those moments is a homemade acai smoothie bowl. It's so good for you (superfoods! antioxidants galore! ), beautiful, tasty and easy (and cheap) to make. At $14 a bowl at our nearby health spots, I can't reason not doing this one at home (+ Netflix, + jammies, + cozy blanket). Pour into two bowls and top with mixed fruit and a variety of toppings.